Snow leopard numbers continue to plummet as a highly lucrative black market demand for their pelts and bones increases. 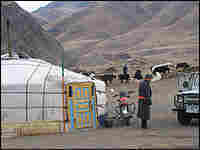 Herding families who graze their livestock in the Altaj Mountains of northwestern Mongolian live in one-room canvas yurts like this one, which are called "gers" in Mongolia. 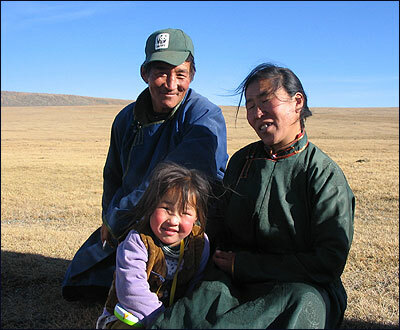 Erdenbaatar, a Mongolian wildlife ranger for Snow Leopard Trust, with his wife, Sandileg, and daughter. Snow leopards are among the world's most endangered big cats. An estimated 3,000 to 6,000 remain in the wild. 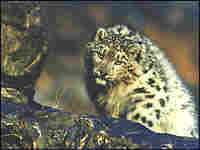 While the predator is protected under several international treaties, snow leopards are rapidly in decline. Poachers can make a small fortune from their pelts, which sell for thousands of dollars on the black market in China and elsewhere. Mongolian wildlife biologist Munkhtsog (traditonally, Mongolians go by a single name) has been tracking snow leopards for the last 10 years. He says while the leopards are rarely seen, "they mark certain landscapes to communicate with each other, like the language of people." I traveled by train, plane, jeep and foot across the Gobi desert and up high into the Altaj mountains of Northwestern Mongolia to join Munkhtsog. As the Mongolian Program director of the International Snow Leopard Trust, Munkhtsog works with local herders to monitor the movements, prey and habitat of snow leopards with the goal of protecting them. The work is difficult as the big cats live in some of the harshest terrain in the world. High in the snowy peaks of the remote Altaj Mountains in northwestern Mongolia, Munkhtsog has taught herders how to track snow leopards from the shallow holes they dig, scent marks they leave on the underside of rocks and scratch marks on trees. By keeping a close watch on the snow leopard population here and in other parts of Central Asia, biologists can determine whether and where they are being illegally killed. In addition, his organization is working with local herding families to make wool handicrafts sold in Mongolia and in the United States to relieve the economic pressure to poach. Erdenbaatar, a herder and ranger in northwestern Mongolia's Yammat Valley, has worked with Munkhtsog and the Snow Leopard Trust for several years. 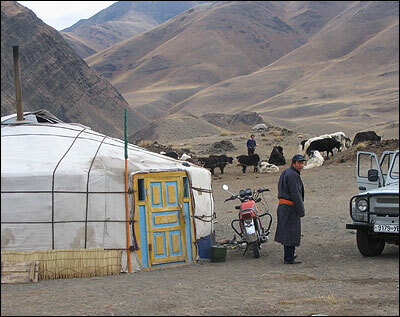 "There are very few of them left in the world, and where there is snow leopard, there is everything," Erdenbaatar says.